Our line of specialty basket boxes, called "intricuts," are like no other. 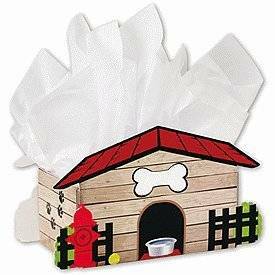 Dog lovers will love the tail wagging style of the Dog House Intricut Basket Boxes, detailed Dog House Intricut Boxes add a distinctive look to any present. All Items sold separately unless noted. Made of 1.6 mm e-flute paper with a gloss finish. 50% recycled content. Recyclable. Food-safe barrier is recommended. Made in China. They have a gloss exterior and matte white interior. Boxes hold up to 10 pounds of product. Dimensions: 13 1/8" x 6" x 7 1/2"